Oil on canvas, 117,5 x 171,5 cm. With a magnificent ancient building in the background, the Virgin Mary presents her newborn child to the kneeling shepherds. 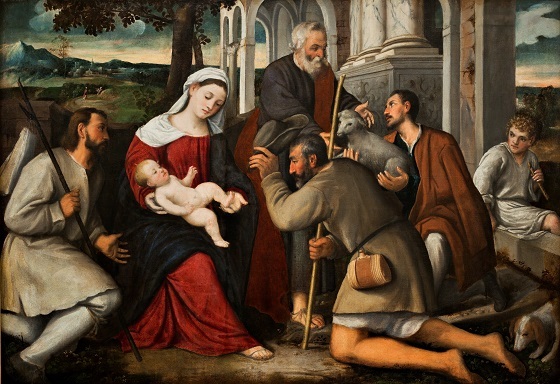 They express their reverence for the Holy Child in different ways; one removes his hat, another kneels, while the third shepherd presents a lamb to Joseph. In addition to being a sacrificial gift for the child, the lamb also symbolises Christ the Saviour, who sacrifices his life for humankind. Veronese’s scene is to a certain degree influenced by the sacra conversazione tradition, where the Virgin and Child are typically surrounded by saints in a contemplative gathering. In this scene the Holy Family is worshipped by humble shepherds rather than elevated saints, however. The lush landscape with mountains in background indicates a strong influence from his colleague Palma Vecchio and his paintings of the Holy Family in the countryside.